Are you looking for a snack that is both nutritious and super tasty? 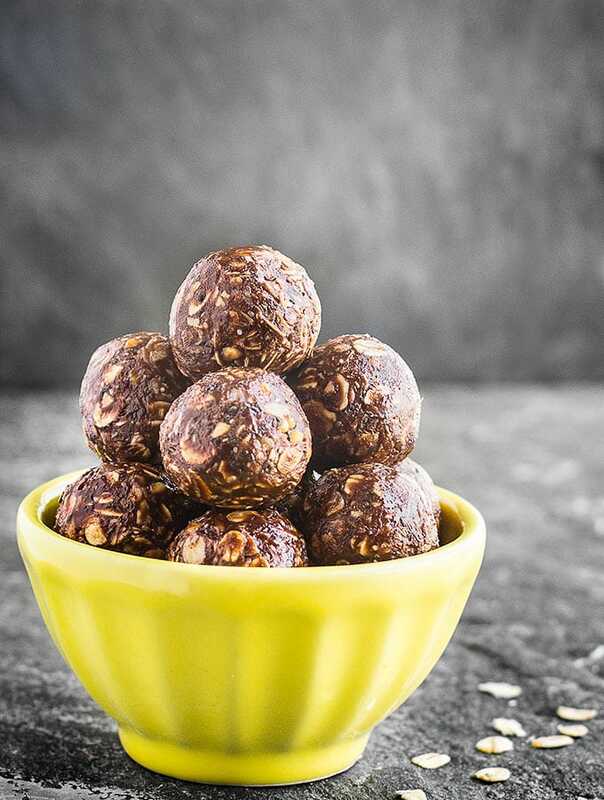 Try these no-bake chocolate peanut butter energy bites. They are simple to make, ready in minutes and packed with wholesome ingredients. 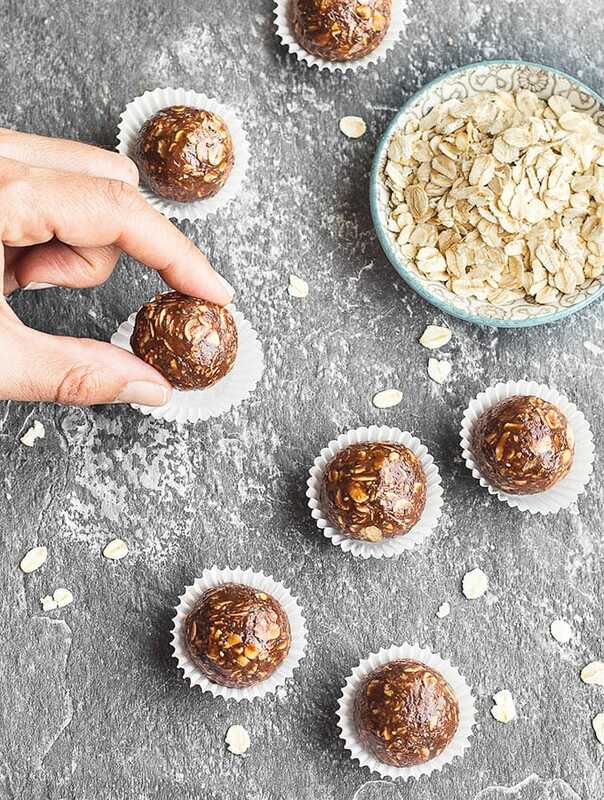 These delicious chocolate peanut butter energy bites make a great grab-and-go snack and come in super handy when you need a pick-me-up after a workout or a long day at work. 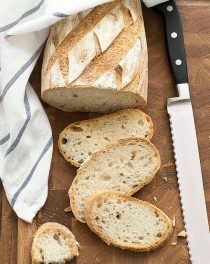 The recipe is quick and easy, requiring just 10 minutes and 5 ingredients. Stir all the ingredients together until combined, pop the mixture in the fridge for 15-20 minutes and then roll it into balls. To form the balls I used half tablespoon measuring spoon, that gives me 2.5 cm (1 inch) energy bites. But you can make them smaller or larger. 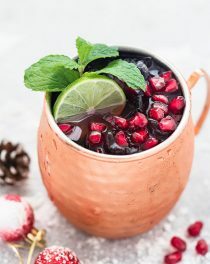 Energy bites are very versatile and can be customized to suit your taste or with whatever you have on hand. You can also add chocolate chips, dried cranberries, goji berries, etc. or roll the balls in shredded coconut. The options are endless! 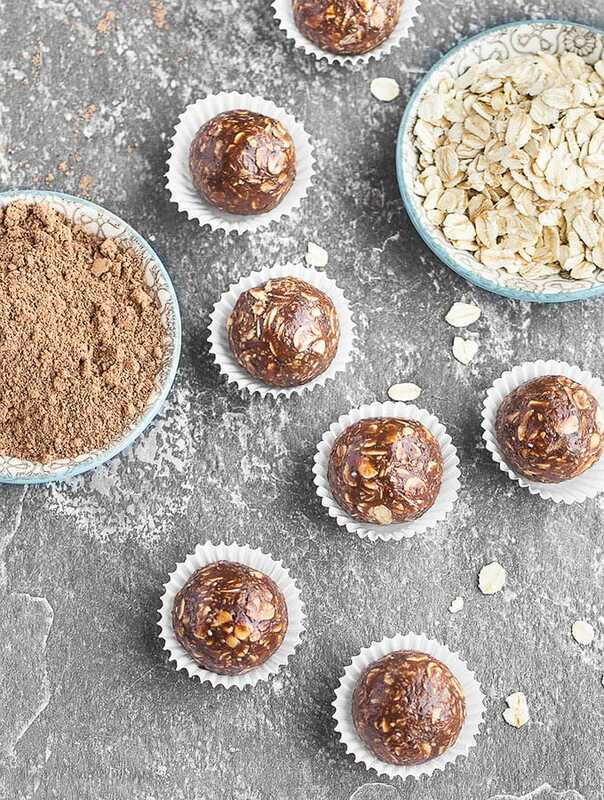 Play around with flavors and create your personal favorite energy bites. If you do change these up try to keep the wet to dry ratios close to the recipe. If the mixture is too crumbly add more wet ingredients (honey or peanut butter), if it’s too wet add more dry ingredients (cacao powder or oats). Store the balls in an air-tight container in the fridge for up to a week. 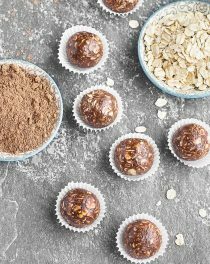 If you try these no-bake chocolate peanut butter energy bites let me know what you think! Leave a comment and don’t forget to take a picture and share it on my Facebook page or tag it #aseasyasapplepie on Instagram! 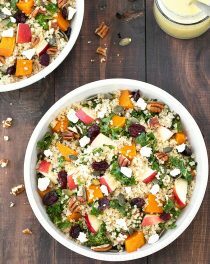 Stir all the ingredients together in a medium bowl until well incorporated. Cover and place in the refrigerator for 15-20 minutes. Store the chocolate peanut butter energy bites in an airtight container and keep refrigerated for up to 1 week. Can I use flaxseeds instead of chia seeds? I only have organic instant oatmeal right now, would that work? Thank you.